At Southwest Rehabilitation speech therapy in Coos Bay and North Bend we always have something fun planned for the members of our community. Check out what is going on this month! 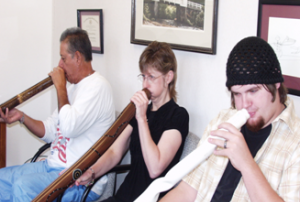 The Didgeridoo Club The Didigeridoo Club meets the 1st, 2nd, and 4th Thursday of each month at 3:30. It’s a great activity for sleep apnea and respiratory impaired individuals. Exercise and socialize at the same time! The Coos Bay Stroke Club Members of the Coos Bay Stroke Club meet the third Thursday of each month at 3:30 at our office. We have speakers from the community present information helpful to stroke patients, family, and friends.